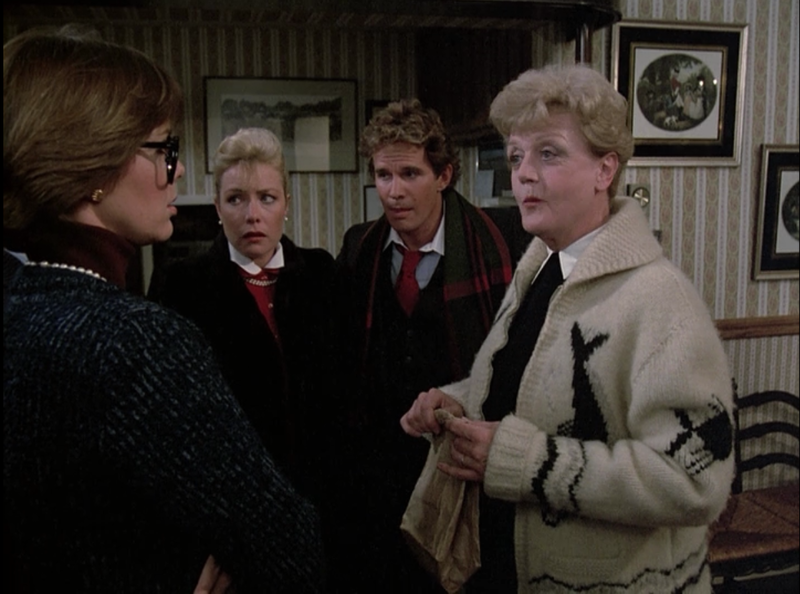 Sabienna: Murder, She Wrote was a staple in my grandmother’s house when I was growing up, so I was vaguely familiar with the adventures of Jessica Fletcher going into “Deadly Lady,” but what I never realized was how similar Jessica is to our last roundtable star, Columbo. They share a creator in Richard Levinson, and he imbued them with the same brand of disarming politeness. They are characters that are designed to be underestimated—Columbo because of his rumpled exterior, and Jessica because of her grandmotherly demeanor—and both use their foreknowledge that they will be underestimated to their advantage. Jessica is fully aware of how she presents herself, and she adjusts her image according to whom she’s with at the time. In an overt Holmesian moment, Jessica allows herself to be completely open about her deductive powers as she obliterates the hobo cover story “Ralph” offers her. By contrast, when she meets the Earl sisters she presents herself as the sweet, doddering old lady who will gladly open her home to them. I don’t doubt Jessica’s kindness, but there is an undercurrent of deliberateness to the way she plays the various suspects and even the police. This keenness doesn’t just make Jessica a good detective; it makes her an interesting character. She is so unlike the standard female television detective that we’re accustomed to seeing these days. She doesn’t take a straight forward approach to her job by being tough and no-nonsense in an attempt to be taken seriously. She seems pretty okay about not being taken seriously right up until the moment she has solved the crime and can leave everyone slack jawed while she heads off to enjoy an afternoon at her favorite fishing hole. Of course, much of this comes from the fact that Jessica isn’t working within the system. For her, crime solving appears to be a hobby, something to keep her inspired and busy while she writes her novels. Unfortunately, much of what surrounds Jessica is far too mild to be truly entertaining. The case had its share of twists, and there were bits of interesting character work here and there (namely the flashes of sadness we saw when Jessica spoke to Stephen Earl about her husband), but the overall tone of the series is so innocuous that it robs the proceedings of any tension, a vital element for a successful mystery. Even the climatic reveal of Maggie as the murderer is undercut by the geniality of Jessica and her would-be assailant. “That wasn’t very thoughtful… now I’ll have to have that pane repaired,” Jessica gently reprimands Maggie for breaking her window, and later Maggie meekly protests when Jessica suggests her frame job was flimsy. There is never any real threat in the scene because it’s obvious from the start that Jessica has the upper hand. 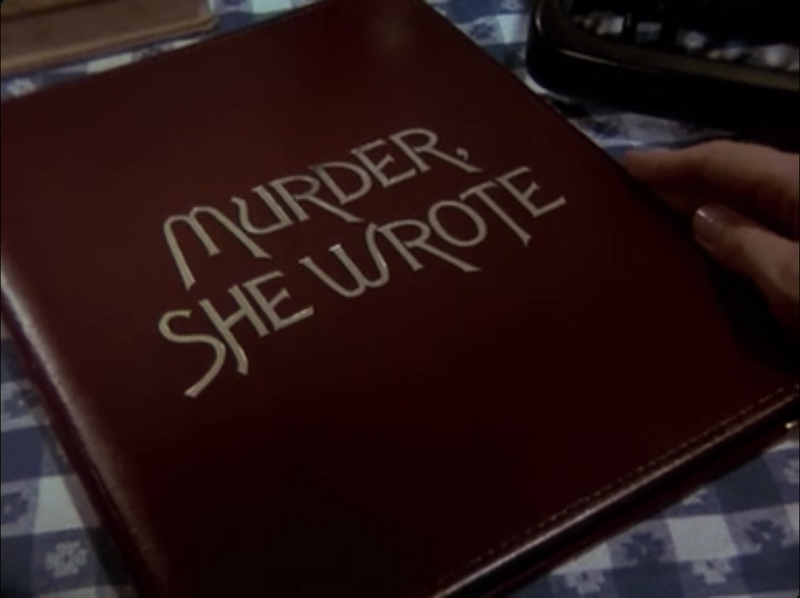 Murder, She Wrote is so clearly a mystery series from another time. It’s pleasant, but also dull. Angela Lansbury is a terrific lead, and Jessica clearly resonated with people if Lansbury’s boatload of Emmy nominations are any indication, but the strength of the character (and the awesomely jaunty theme tune) weren’t impressive enough to have me clamoring to book a return visit to Cabot Cove anytime soon. Kerensa: One thing that I keep thinking about during this roundtable is whether or not a show would currently make it on air. And I don’t think Murder She Wrote would air on current television, let alone last for its insane 12-season run with multiple follow up TV movies. I hate that I’m going to say this, but in our current TV climate, whether it’s a more crime/detective based show like we’ve been focusing on, a typical “older woman” is in her forties and more than likely still a total babe even though she’s viewed as “aging.” And Jessica Fletcher goes beyond toeing that age line, in a way that I think wouldn’t fly now (even though we all know that Lansbury is a babe). 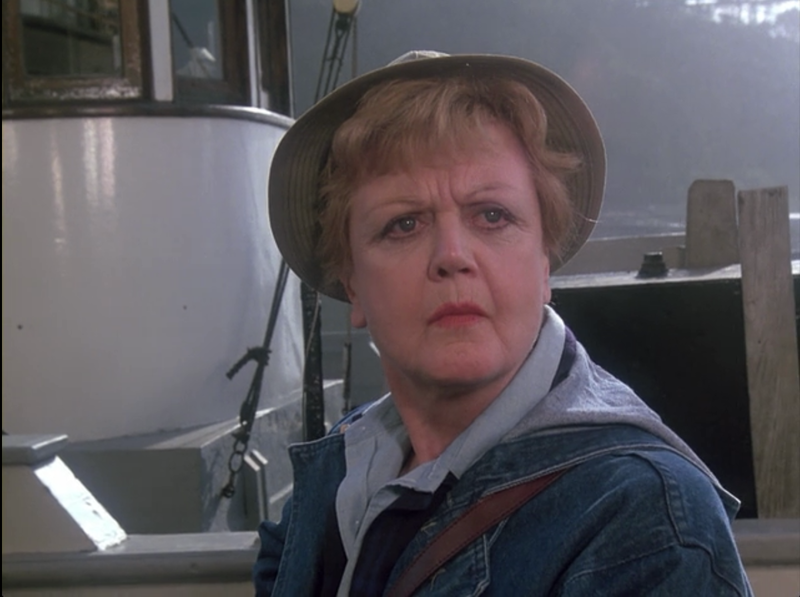 Murder She Wrote follows Angela Lansbury as Jessica Fletcher, a mystery novel writer who lives in an idyllic coastal town in Maine where apparently an abnormal amount of murder occurs. After watching “Deadly Lady,” I wasn’t surprised to read that the creators of the show had worked on Columbo in some capacity. Jessica is in her fifties and reminded me of a grandmother, who would hand you a Werther’s Original, maybe make you a hot toddy and gossip with you about the local folk. Except she excels at solving crimes. Similarly (and I would say much better than Columbo), Jessica has an innate knack for being able to solve these crimes and certainly not in such a bumbling manner. In fact, she makes it look extremely easy. 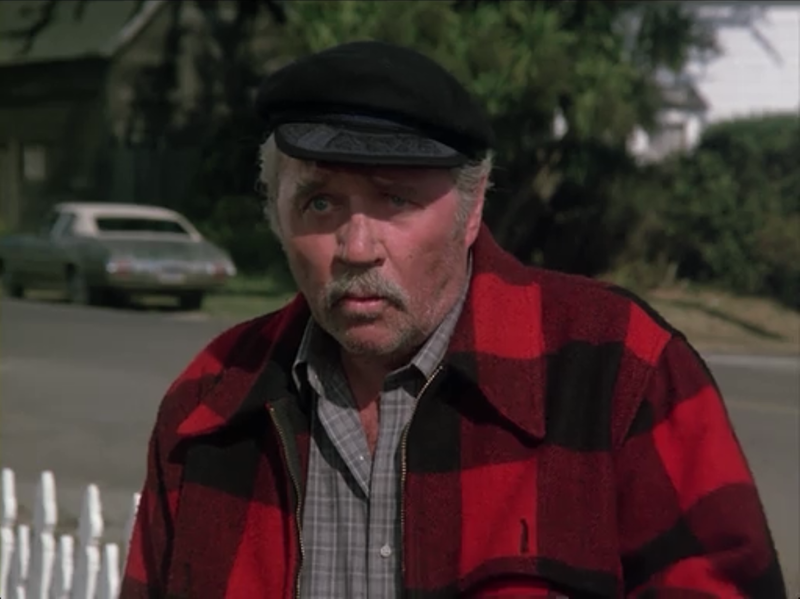 In this episode, that I’ve alternately titled “Daddy Issues,” a drifter (personal fact: I always love a good drifter plot) named Ralph ends up at Jessica’s home and offers to help out in exchange for food/place to stay. This happens directly after a storm has hit and police (Claude Akins and Tom Bosley (!)) are investigating a man overboard situation on a yacht. Both policemen make a lot of digs at rich, upper class people which seemed, at least for me, to frame the show in a distinctly middle-class way. The four daughters of Steve Earl, a very rich man, were on the yacht at the time of his disappearance with a story that rapidly evolves. First as a man overboard situation, into a murder, then into Steve’s chosen disappearance. We learn that Steve is the drifter Ralph that had been staying at Jessica’s home, right before we see his body floating face down in the water. While Jessica solves the crime flawlessly, the show constantly throws various (and now tired) red herrings at the viewer, a money hungry former fiancé, a current money hungry husband and the varying shades of mean girl sisters—so it’s unsurprising that Maggie (the original sister who confessed) is the one who committed the crime because she hated her father and hated that he loved her sister, Nan, more than her. I agree with Sabienna, that Murder She Wrote is perfectly fine but kind of boring. Angela Lansbury is the main reason to watch. One final thing that surprised me while viewing, was that I got a distinctly Twin Peaks vibe when the small town was the focus. Now, imagine that crossover: Jessica Fletcher and Agent Dale Cooper working together. That I’d watch. Les: That is certainly a crossover I would watch. I can just picture Jessica cooking up a big breakfast and Cooper diving in with gusto, praising the virtues of Cabot Cove’s fresh sea air and excitedly telling Diane about the sandpipers he’s glimpsed on his morning stroll down the beach. Or at least I would certainly enjoy that more than Murder, She Wrote. I tried to approach the show with the most open mind I could (and was cheered early on by Jessica and Ralph’s discussion of the etymology of “hoboing”), but there’s no getting around the fact that, like both of you, I found the whole thing fairly dull. As much as I understand that the show’s aiming for an entirely different audience than any of the other three shows we’ve watched, sadly I’m not part of that audience and couldn’t work up a lot of enthusiasm for the events of the story. On a structural level, I found it hard to get too terribly invested in the way the mystery played out—none of the four sisters felt fleshed out enough to pick one for the mystery, and in our brief glimpses of the victim he seemed a little shifty but in no way deserving of the malice his daughters allegedly for him. And while the show was clearly making an effort with all those aforementioned red herrings, the moment where Maggie said “And besides, I don’t wear pink” may as well have paused the show and lit up a massive neon sign of “GUILTY! GUILTY! GUILTY!” for all the projection it did. Not that I hated “Deadly Lady” outright though, as not being personally interested in it doesn’t mean there weren’t interesting things going on here. The setting of Cabot Cove was in keeping with the unpretentious, down-to-earth nature of both Jessica and show—it wasn’t played for laughs, rather that this was a community that had its own way of doing things and liked to keep it that way. 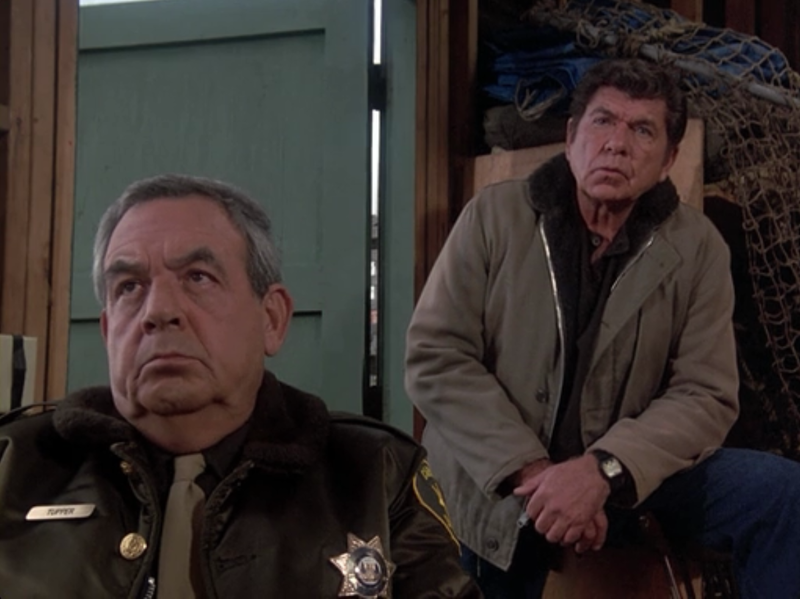 Tom Bosley’s Sheriff Amos Tupper could have very easily been played as the country bumpkin outsmarted at every turn by this retired English teacher, but was clearly nobody’s fool and entirely willing to call Steven Earl’s* daughters out for trying to force an inquest. I also particularly liked the detail where the newspaper publisher talks about copying an image for the paper from a 20-year-old book at the library, the sort of thing that would make a major media outlet scream. Based on some cursory reading I know the show expanded outside Cabot Cove many times in its lifespan, though it and Jessica always came back there, and it’s not hard to see why. *I hope I wasn’t the only one who kept confusing the murder victim with Steve Earle, singer/songwriter and supporting player on David Simon shows. Tying the show back to other entries this roundtable, what I definitely liked about this one was both how it followed in Columbo’s footsteps of the unassuming detective, but also followed in the path of Hart to Hart in terms of the investigation’s context. 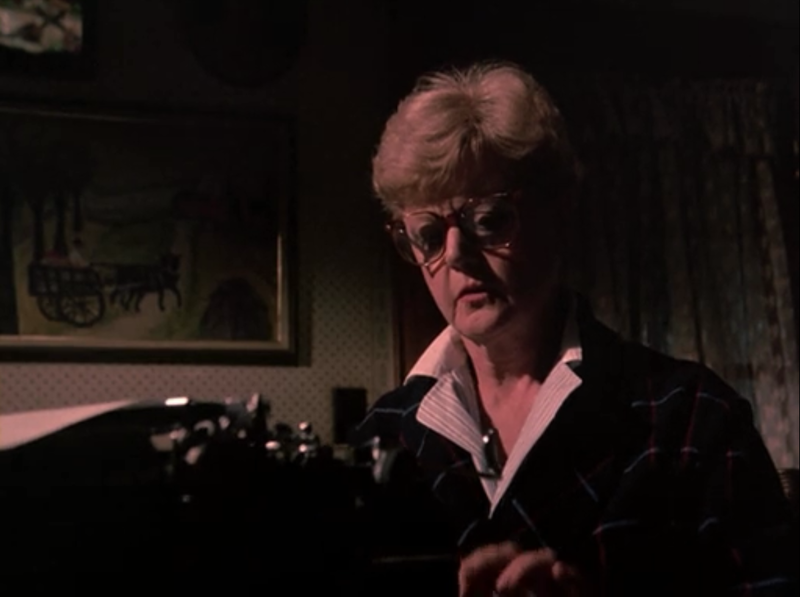 Like the Harts, Jessica Fletcher isn’t a professional who does this for a living, she’s someone who just happens to be in the wrong place at the right time, someone who gets pulled into murder investigations by way of her connections and who sticks with them because of her innate curiosity. And while it would certainly strain credulity after a few seasons (turning them into John McClanes of murder investigations) I appreciate the way that role allows for more leeway than a homicide detective or a private investigator. If Remington Steele or Columbo tried to investigate Earl’s death they’d be automatically shunned and have to charm their way into getting details—Jessica on the other hand can be as involved as she wants, and no one seems to bat an eye. And yes, a round of applause is due for Angela Lansbury’s performance as Jessica. That early Holmesian moment Sabienna mentioned earlier was delightful, and I enjoyed how the show had repeated ways for her to illustrate her powers of deduction. Despite her unassuming appearance heading from place to place on her bicycle, she couldn’t be put off or intimidated. I think my favorite moment was when the confidence man mentions his expletive-laden rant at Earl but refuses to repeat it, she curtly replies “I am familiar with most Anglo-Saxon words, Mr. Jones.” As with so many of our detective shows, it’s more about the investigator than the investigation, and it’s no surprise to me that Lansbury racked up nominations for a staggering twelve Emmys and ten Golden Globes. It’s a good performance from a good actress, I just wish there was more of a show around it I personally wanted to watch. Really nice pattern and good written content , practically nothing else we need : D.